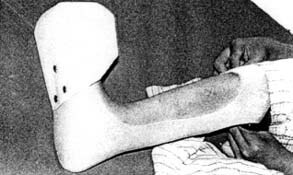 MARGARITA was born with club feet (equino-varus). When she was one month old, her parents took her to PROJIMO. 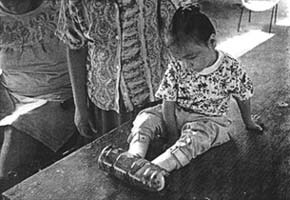 The village team put her feet in plaster casts for 6 weeks, and gradually corrected the deformities. Then they made plastic braces to hold her feet in a slightly over-corrected position. One year later, Margarita began to walk. When she was 1 year and 4 months old, she was walking fairly well. However her mother was concerned about her "pigeon-toed" feet. Indeed, when she walked, her feet turned inward a lot. On examining her, this appeared to be due in part to the position of her feet in relation to her legs, and in part to inward rotation of her hips. 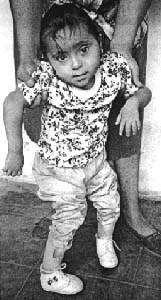 Margarita's parents had taken her to an orthopedist who prescribed a device, for use at night, that would hold her feet turned outward (externally rotated). This involved a metal bar attached to outwardly-rotated orthopedic shoes. The bar and shoes would cost the family over 800 pesos (US$ 100.00). Short of money, the family returned to PROJIMO to see if a less costly solution could be found. To create a night-appliance that would hold Margarita's feet in an outwardly-rotated position, the PROJIMO team improvised a simple device using a half-liter plastic bottle. It only took about 5 minutes to make, and it cost nothing. 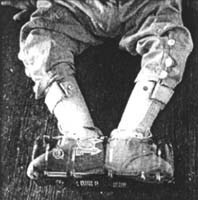 The same high-top shoes and plastic braces that the child wore during the day could be used with the foot-tube at night. No other equipment or costs were required. To make the foot tube, a long, slender plastic bottle can be cut with a knife (or an electric grinder). Remove both ends, and cut an oval in the middle of the bottle, just large enough to fit both feet through it. When the new device was tried, Margarita seemed comfortable. However, her parents worried that she would fret and be unable to sleep at night with her feet confined. The PROJIMO team advised them to start by putting the appliance on Margarita's feet for short periods. As she got more used to it, the time could gradually be extended. RESULTS: After two months of using the "foot-tube" appliance at night, Margarita's parents agreed that she was walking with her feet in a more normal, less turned-in position. DUPLICABILITY AND ADAPTABILITY: This appliance has since been made for another child, with a piece of soft-plastic water pipe (stiff, but with moderate flexibility). With the plastic pipe, the feet can be separated, as well as outwardly-rotated. CAUTION: This plastic bottle method cannot be recommended for all children with in-turned feet. It worked for Margarita, whose feet could easily be opened widely. But if a child's feet do not open easily, or if the rotation appears to be forcing the hips or knees into a distorted position, don't use it. If the feet cannot be rotated outward easily by hand, it is better to use a device that will rotate them more gradually. The shoes can be screwed to a wood or metal cross-bar like this. If you have to use force, or if it hurts, don't do it. JESÚS is a boy who was born with spina bifida, a defect in the spinal-cord that causes paralysis and reduced feeling in his legs and feet (see page 131). 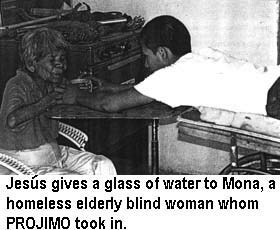 Chapter 45 explains how Jesús became involved in Child-to-Child activities with other children and school teachers. Here, we look only at the problem of chronic sores on his foot. Jesús' loss of feeling from his hips to his feet has caused repeated problems. As a young child he was able to walk, although with considerable difficulty. Sores developed on his right foot and because he had no feeling in his foot he continued walking on it. Infection set in, spread to the bone, and eventually the whole foot was dangerously infected. When he was 6 years old, his lower leg had to be amputated (cut off). When Jesús first came to PROJIMO, he had pressure sores on his backside, which were the result of reduced feeling. From crawling around on all fours, he also had sores on his stump and on the toes of his left foot. 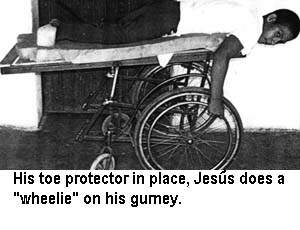 To keep pressure off the sores on his bottom, the PROJIMO team had Jesús spend time on a wheeled cot (called a gurney, see Chapter 37). Inez cleaned his sores daily, and treated them with honey. The pressure sores on his backside were healing well. But the sores on his toes grew bigger and deeper. The problem was that Jesús was very active. He kept bumping or scraping his toes, or lying with them pressed against the gurney. The bandages quickly got dirty and matted. Mari told him to be more careful, but since he felt no pain in the open sores, he was careless. Unless a way could be found to protect Jesús' foot, Mari was afraid that his left leg might also eventually have to be amputated.What to do? A simple device was needed that would protect Jesús' injured toes from all sides, yet would let air circulate freely (especially because the weather was extremely hot). Marcelo, the brace and limb maker, found a solution. 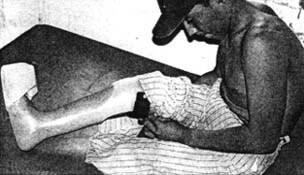 He riveted the bottom half of a square plastic bottle to Jesús' plastic lower-leg brace. It fit around the end of Jesús' foot and shielded the toes without touching them. RESULTS. Pleased with his new device, Jesús took care to use it all day long. The results were impressive. In 4 days the sores were dry, clean, and well on their way toward healing.